News Flash! 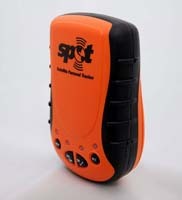 SPOT v.2.0 came on sale for about $149.00 in stores in September 2009! Read More below, but read this page first! At first I was attracted by the reasonable price of $169.00 for a seven ounce "Personal Locator Beacon". Then I realized that this device is NOT YOUR MOTHER'S "PLB". This "Satellite Messenger" is based on messages sent through the world wide privately owned Globalstar, Inc. Satellite Phone System and not based on the old PLB COSPAS-SARSAT search and rescue system! 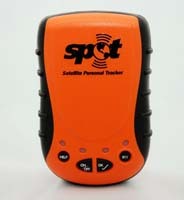 Also, the SPOT Satellite Messenger (listing at $169.00, but available most everywhere at $150.00! and sometimes on sale for $99.00) uses an internal GPS (global positioning system) receiver not found in PLBs costing under $650.00. GPS latitude-longitude coordinates are found by the instrument through conventional contact with the worldwide constellation of US Defense Department satellites, just like your trusty Garmin eTrex H. Then, the SPOT sends the "GPS location" (Latitude and Longitude coordinates) and your selected message "I am exactly here and having fun"; "I am exactly here and need help from my friends"; or, "I am exactly here and I have called 911 for official rescue services!" The email or text cell phone messages are sent to up to ten people each. For years, we purchased expensive big orange marine EPIRB devices for our "yachts". They could not be tested but at least made a nice statement about our "off shore" capabilities just hanging at the hatch. The smaller class B EPIRBs that broadcast at 121.5 MHz based on older technology may take hours to provide the Coast Guard with a location and may not be monitored today by commercial shipping according to a report in the February 2008 issue of Sea Kayaker Magazine. This technology is being phased out. EPIRBs and PLBs may not come equipped with an internal GPS receiver and may not provide accurate Latitude and Longitude coordinates. The SPOT is a new technology. It is not a "PLB". Read on! 1. I am exactly here RP and friends and I am OK; 2. I am exactly here RP and friends and I could use a little help right now; and 3. I am exactly here RP and friends, 911 has been called and I need real Rescue Services. My friend Jim Witty, outdoors reporter for our Central Oregon regional daily, The Bulletin, called in December 2007, to ask what I thought about this new device. I said "I think it is terrific" It's a huge thing!" He quoted my exclamation in his news story. Jim had purchased two with his brother and they drove out to the backcountry to test the device. Jim used message 1. and shortly received a call on his brothers cell phone giving his Latitude and Longitude coordinates and an "I am OK" message. They raced home to find an email message to their Responsible Person: "I'm OK", with a Google map showing their coordinates. Jim Witty scooped Central Oregon with a huge spread on the front page of the Wednesday January 2, 2008 Community Life section of The Bulletin. Further, he used my cogent quote: "Don't wait for your Responsible Person to call 911 when you fail to return at 5 p.m. on Sunday" said Speik, "Reserve the option to call for assistance when you break your leg on Friday, using your ordinary digital cell phone and/or your new Spot locator beacon." My friend Cpl. Neil Mackey of the Deschutes County Sherriff's Search and Rescue Unit told me that SAR had recently tested the Spot Satellite Messenger in the field, using Message 3: "911, I need Rescue" and they found that it worked well. REI sells the product for $149.00. This device was so new, that Associates at the store in Bend before Christmas were not familiar with the SPOT and were very interested when I explained to them that it was an important breakthrough: Satellite communication to a Responsible Person's cell phone and their email account and, if needed, to 911 Rescue Services by messages with GPS coordinates. Note that the SPOT Satellite Messenger requires a $99.99 annual satellite telephone service subscription. You can sign up on the web. You can actually list up to ten recipients for each of the three messages. Peter Kummerfeldt, well known Outdoors Instructor based in Colorado, suggests you leave your mother off the 911 list. Peter says he has tested the Spot many times and confirms that it works. Peter gave a talk at the Central Oregon Sportsman's Show, which featured the Spot. 911 Emergency Services are Powered by GEOS Alliance. Let up to ten contacts know where you are and that you’re okay. Unlimited usage included. Request help from up to ten friends and family at your exact location. Unlimited usage included. Dispatch emergency responders to your exact location and notify up to ten friends and family. Unlimited usage included." A $49.00 Geos option allows you the interesting unlimited ability to track your progress periodically on Google Earth with messages to your Responsible Persons). Adventure Racers like this feature. "For $7.50/year USD (if purchased at initial activation. $150.00 USD afterwards) you are provided up to $100,000 USD of additional search and rescue resources, including helicopter extraction around the world and reimbursement benefits – underwritten by Lloyd’s of London – for any emergency service expenses incurred. For more information, including terms and conditions, visit http://www.geosalliance.com/sar This option may not be necessary in the United States due to our sophisticated 911 emergency service and Sherriff's volunteer Search and Rescue teams. However, in other parts of the world, rescue of American citizens may be organized by the nearest Embassy. "The SPOT Satellite Messenger, the world's first satellite messenger, uses both the GPS satellite network to determine a customer's location and the SPOT network to transmit that information to friends, family or an emergency service center. SPOT Inc., a subsidiary of Globalstar, Inc., (NASDAQ:GSAT) provides lifesaving communications technology that allows users to communicate from remote locations around the globe. Thanks to this affordable, cutting-edge personal safety device, the company offers people unmatched peace of mind by allowing customers to notify friends and family of their location and status, and to send for emergency assistance in time of need, completely independent of cellular phone or wireless coverage. For more information on how SPOT, Inc. is helping users live to tell about it™ – from disaster preparedness to outdoor adventure purposes – explore this web site." Copyright© 2007-2010 by Robert Speik. All Rights Reserved. Warning: the spot must be used correctly! Recently, three testers on BackPackGearTest.org questioned the ability of SPOT to connect to the GPS satellites and to the Communications satellites. "I wore the spot on my pack's sternum strap because there weren't any better options for securely mounting the device on the pack anywhere else." "The belt clip which is held in place by one of the flathead screws had begun to loosen itself over time allowing the belt clip to be sloppy and not stay securely in place. I think this might have attributed to the Spot coming off of my shoulder strap at Gold Creek." "As I hiked the Spot was clipped to my belt on the front of my pants." Photos by "Coasty" show the SPOT propped upright next to a rock, virtually eliminating contact with the satellites. Copyright© 2008 - 2010 by Robert Speik. All Rights Reserved. How to use the spot correctly! Perhaps it is not obvious on the SPOT website or in the booklet packed with the device, but SPOT MUST BE LYING ON ITS BACK WITH THE LABEL UP IN ORDER TO HAVE MAXIMUM CONTACT WITH THE GPS SATELLITES AND THE COMMUNICATIONS SATELLITES. People standing around the unit or placing it next to a boulder may also block the line of site electronic signal. Garmin GPS receivers, on the other hand, must be standing up straight with the the users hand at the lower part of the unit and no people hovering over and around it in order to see what is going on. To re-state it, SPOT is best at connecting with the GPS satellites and to the Communications satellites when it is comfortable lying on its back with the label up. The antenna needs to see the entire sky and not just half or less off to one side. This is kind of explained in the booklet packed with the unit. I have checked this information with SPOT Customer Service and I have heard this explained by a SPOT distributor. Clip the SPOT to the top of your Saloman "Raid Race" summer Day pack of take a rest and give it a chance to get comfortable on its back on a rock. My wife and I are Federally licensed General Class Ham Radio Operators and we have studied the way "antennas" work. They are directional, and that is why the GPS and the SPOT must be oriented correctly. This is not a design fault. I agree with some that the SPOT User Guide should be more clear. I agree that the nice big belt clip should be removed by the operator. Place the SPOT in the top pocket of your day pack (yes, on top of the extra hat, gloves and ClifBars). Or turn it on when you stop for lunch, camp or a 15 minute break. Note that PLBs must actually deploy an antenna and that it must be pointed at the sky and many models require factory service to charge the battery. Bloggers on NWHikers.net are concerned because of this connect ability question. I will bet their SPOTS were clipped on belt or pack and not HAPPY. One described how he got a good contact when he laid the SPOT (flat) on the hood of his car. One described how the unit was oriented: . . ."keep spot upright and make sure it's free from obstruction . . . Another referenced the tests from BackPackGearTest.org. that we have noted were not oriented correctly. Personally, I am a happy well oriented user. Again, an improvement of SPOT over traditional PLBs which were recently authorized for land use in July 2003, is it's ability to real-life "test" the communication signals where the user hikes, hunts, sleds, skis, climbs and wanders. If the user programmed message "Hello, I am exactly here and I am having Fun" message gets through, so will the "I am exactly here and 911 Rescue Services are on the way, but don't worry Honey". The traditional PLB can be tested for sending out a signal. It cannot be tested for whether the signal has actually been received by 911. Again, an improvement of SPOT over PLBs is the ability to "real-life test" the communication system where the user actually hikes, hunts, sleds, climbs and wanders. If the user programmed message "Hello, I am exactly here and I am having fun" gets through, so will the message "911 Rescue Services are on the way, but don't worry Honey". The traditional PLB can be tested for sending out a signal. It cannot be tested for whether the signal has actually been received. DISCLAIMER: I AM NOT AN ENGINEER OR TESTER. THESE ARE SIMPLY MY EDUCATED THOUGHTFUL OPINIONS! How do digital mobile phones assist mountaineering and backcountry rescues? What is a PLB or Personal Locator Beacon?